If you have a dedicated Ubuntu web server, and want to host multiple websites from it, the easiest way to do it is using Apache Name-Based Hosting. This method of web hosting relies on the client ( people browsing the Internet ) typing the domain name of the website they want to visit. using this method, people cannot get to your website using an IP address, they must type the domain name on their browser to get to your website. 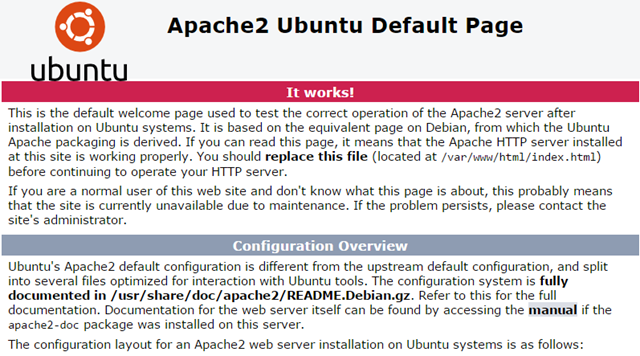 to complete this guide, we need to have a valid domain name that we want to redirect to our web server running apache. Note: In this guide I will use forevergeeks.com as example with the external IP address 45.79.134.144 pointing to my server. please change the information to match yours as we go along. The DNS record change takes awhile to propagate some times, so you might not see the change happening right away.Once you are done setting up the IP address for your domain, let’s work on the server. I’ll assume that you haven’t installed apache on your server yet, and to make things easier, I will install MySQL and PHP along with Apache as well. most websites are built on WordPress, Drupal, and other content management engines that utilize the whole LAMP stack. change the virtualhost information to reflect yours. also remember to change or create the directory for the “DocumentRoot” where the website files will be hosted. that means your virtualhost is now working. upload your web files to the “DocumentRoot” folder you created above to make your website go live! to prevent directory listing on your Virtualhost, type this this on terminal sudo a2dismod autoindex and then reload apache to take effect. If your website was built with WordPress or any other content management software that allows you to setup custom permalinks, then you most likely will need to enable Mod Rewrite on the server. to do that type this on terminal sudo a2enmod rewrite and reload apache. Repeat the same process for all the websites you want to host on this server. there is no limit on the amount of websites you can host on a single server, as long as you have the resources, RAM, CPU, Storage, bandwidth, etc, to do it.